IDAS™, Icom Digital Advanced System, is Icom’s digital land mobile radio system using the NXDN™ common air interface. 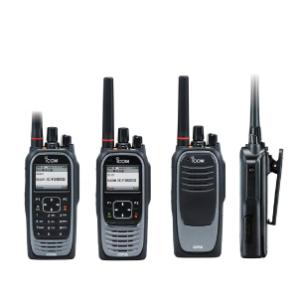 IDAS offers a complete system of handheld radios, mobile radios, repeaters, network interface/trunking controller, remote communicator, system manager software and various accessories. IDAS is a complete digital solution that system owners or operators can grow into as their time and budgets allow. The IC-F52D series is a next generation IDAS handheld radio. It not only inherits technical design advantages from the IC-F3400D series, but also offers state-of-the-art improvements, while applying size and usability from the hugely popular IC-F50V/IC-F50 series analog models. The IC-F52D series is a true mixture of legacy and modern technology in one of the most compact packages available today. The IDAS F3400D series two-way radios sport an updated look and design. Their plethora of functions and the attention to hardware details only Icom can provide brings you a solution that makes you look smart and work smart too. Refinements and enhancements to design, usability and features – combined with the electrical and industrial hardware improvements – further the total reliability of the new IDAS series. This reliability ranges from the “zero adjustment”, non-variance production quality of every radio made to a new and stress-free user experience that masks the real complexity behind this multi-protocol platform. 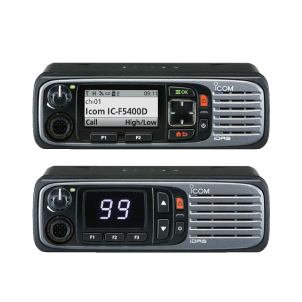 The F5400D series radios are Icom’s new flagship IDAS product. Dozens of new features and functions are included all in one new small form factor size. Features like SD Card, USB interface and Bluetooth appear for the first time in this land mobile product. A brilliant color display allows for easy observation of critical information, in the dimmest of light to the brightest of sunshine. The IDAS digital radio system has two protocol choices, NXDN and dPMR. Both protocols are open digital radio standards using 6.25 kHz FDMA narrowband technology. With this flexible choice, the IDAS radio system allows for interoperability with other manufactures equipment for seamless supply or replacement of existing NXDN and/or dPMR systems. Naturally, these FDMA based protocols are a perfect match, when migrating an analog system to digital. The IDAS handheld radio is built durable to endure 1 m depth water for 1 hour and dust-tight protection. 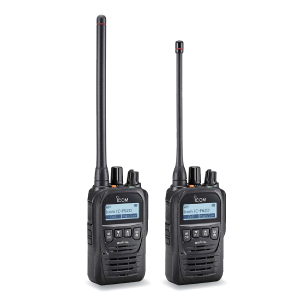 The radio also passes MIL-STD-810 specifications. A high-resolution color LCD and new user interface is adopted. The color LCD enhances the visibility both in natural and indoor lighting, with the night mode LCD setting as an alternative for use in night time or low lighting conditions. Functions can be easily set by following easy to understand icons and menu items.